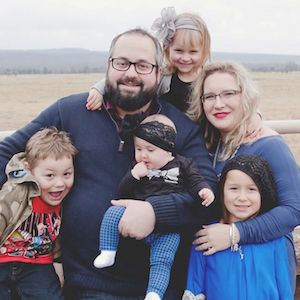 Lee and Sarah Kemp are church planters currently living in Fort Smith, AR. They have been blessed with 4 children in their 9 years of marriage: Halie 8, Andy 6, Khloe 4, and Hadassah 6 months. Lee has served in full time ministry for over 12 years. Lee is passionate about evangelism and leading the local church to be missionally focused. Lee and his wife started Forefront Church in the summer of 2013 by living and ministering to a large apartment complex located in the inner city. Since then, six other friends in the ministry have moved their families to help plant the church. Forefront held its first corporate worship gatherings in September 2014. Currently we meet on Sunday mornings at Grand Avenue Baptist Church's Student Ministry building. Our plan is to officially launch the church at a new location in the fall of 2015. Located in Fort Smith, AR, Forefront Church is a Gospel centered and Kingdom minded church. Forefront exists to REACH the lost, EQUIP the saved to reach others, and SERVE God by using our gifts to show Jesus to the local community. We seek to fulfill this purpose by focusing our efforts on leading all members of the church towards "missionary formation." Every member is challenged to realize that they are a missionary where they live, work, and play. Two of our distinctive ministry initiatives are multi-housing missions and a targeted transitional living program. Join us in praying for 100 Salvations in 2015, as we focus on a church-wide emphasis on personal evangelism. That God continues to open up the doors of ministry opportunities to our local community. We are looking for at least 10 churches who would partner by bringing a missions team to serve one full week of our Summer Kids Program that we are hosting in two different apartment locations this summer.